We’ve all been in situations where there’s something amazing to see, but where we’re too far away to see it adequately. Whether we’re at a graduation ceremony, a baseball game, or just out hunting and birdwatching, we wish we could see things with precision and clarity. Of course, there is a way that we can do this, and that way is with a pair of binoculars. These double-eyed lenses can magnify objects at huge distances, allowing us to get close to things that we’re not even in the proximity of. But, how do you choose a pair of binoculars? Especially for under $100.00? With this guide, we have all the answers. Bushnell has been making outdoor optics equipment since the 1940s. The company has a reputation as one of the leaders in outdoor optical technology, creating everything from high powered rifle scopes to high powered binoculars. 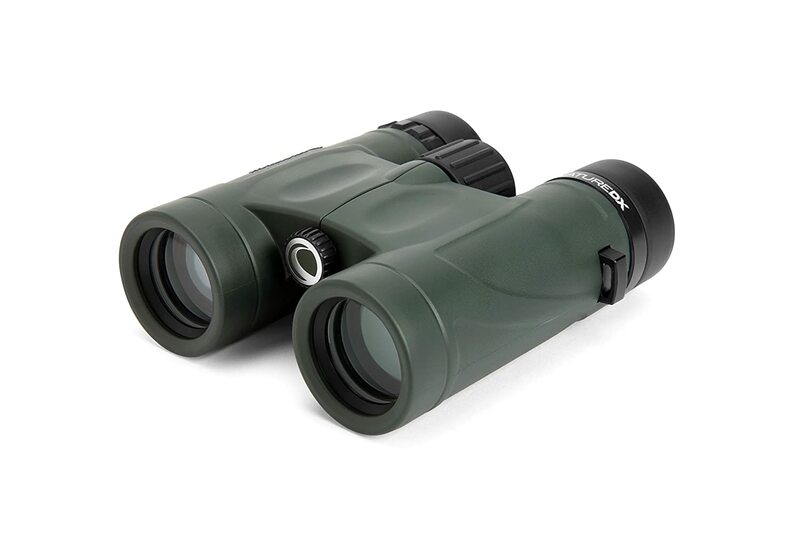 Their best pair of binoculars under $100.00 is the Bushnell Trophy XLT Roof Prism Binoculars. These provide you with not only razor sharp images, but also supreme durability. First, let’s talk about this pair’s picture quality. Providing you with 10x magnification and a 42 mm lens diameter, you will be able to see things at huge distances without sacrificing anything in the way of light or clarity. Its fast center focus system allows you to get clear pictures in as timely of manner as possible, ensuring that you don’t miss anything. Its field of view at 1,000 yards is 325 feet which isn’t as large as many high-end pairs, but will still give you quite a large area in which you can see different moving objects. A 15.2 mm eye relief will allow you to keep your eyes a decent distance away from the eyepiece without sacrificing any image quality. This makes it good for people who wear glasses. Twisting eye covers will also provide you with a great deal comfort. Measuring in at 7 inches x 6 inches x 3 inches, this pair is fairly compact. It’s not tiny, but you certainly wont have any problem toting around its miniscule 2 pounds. Waterproof and fog-proof, you will be able to take it out into any weather condition without worry of damage. Its housing is made of rubber that provides you with terrific grip and does a great job of withstanding wear and tear. It can take drops and nicks without much damage. Giving it excellent image quality is its multi-coated lenses which will emit more light, making images brighter and sharper overall. Online reviewers love this pair for its image quality, stating that it’s easy to adjust its focus and that it has a wide field of view. Reviewers also give it credit for its durability and grip-ability, noting its rubber housing, and stating that it feels solid and comfortable in their hands. Many reviewers complained about the quality of the lens covers, stating that they fell off very easily, leaving the lenses exposed when they did not want them to be. Some reviewers also said that the pair was a bit bulky, stating that it was bigger than anything else they had ever used before. However, most reviewers had no complaints about the size. 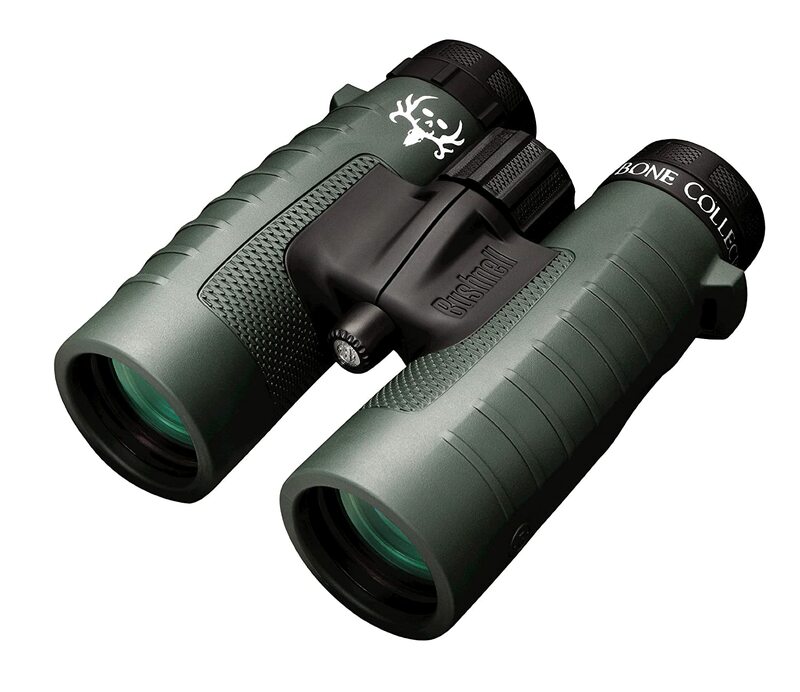 Overall, the Bushnell Trophy XLT Roof Prism Binoculars are a great tool whether you’re looking to go hunting, birdwatching, or see anything at a distance. Their supreme durability combined with their precise and sharp image quality make them an affordable option for all different purposes. 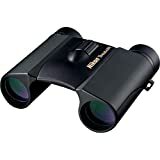 If you’re looking for a very nice set of binoculars under $100.00, the Bushnell Trophy XLT Roof Prism Binoculars are definitely something you should check out. They’re available for around $125.00 on most online retail sites. Nikon is renowned for producing some of the top optic and imaging products in the world. From cameras, to rifle scopes, to binoculars, the company puts everything they have into every product that put out. At the moment, their premier pair of binoculars under $100.00 is the Nikon ACULON A211 10×50 Binocular. Easy to use and highly durable, it provides you with sharp and precise images from both close and far distances. With an 8x magnification and a lens diameter of 50 mm, it produces large, well-lit images at very long distances. A large 341 foot field of view allows you to see a great deal from 1,000 yards and more. This makes it great for birdwatching and hunting as you won’t have to move it to keep your eye on animals that are in motion. This will, in turn, reduce its shakiness, contributing to a better picture overall. Providing 11.8 mm eye relief, you can make use of it whether you wear glasses or not. Providing your eyes with more comfort are turn and slide rubber eye cups which allow you to position them to meet your specific needs. Measuring in at 4.25 inches x 4.25 inches x 8.6 inches, this set is not exactly small. However, at 2.5 pounds, it’s still very easy to carry around. You aren’t going to suffer from any fatigue problems, to say the least. In fact, due to its very grip-able rubber housing, its easy to hold whether in rainy or dry conditions. This housing also provides it with great durability. You won’t have to fuss over dropping it on the ground or accidentally banging it against something hard. Unfortunately, it’s not waterproof, so it’s prone to fogging up and damaging in the rain. It can be focused with a single central focus knob. You just twist it until you get the view you’re wishing for. With its multi-coated lenses, it will give you precise and well-lit images in any type of lighting situation. Online reviewers love this set for its image quality, with one reviewer saying that he can see landmarks that are 30 miles away from his 30th story apartment. Reviewers also give it credit for how comfortable it feels in their hands, stating that it’s very ergonomic and that it’s easy to lift up and use. Some reviewers complained about the lens covers, stating that they would fall off at times when they didn’t want them to be off. Other reviewers complained about how much they fog up in cold conditions, stating that they’re almost impossible to go hunting with. All in all, the Nikon A211 is a great pair of binoculars for fair-weather purposes. Though it can’t withstand the elements, it produces sharp and clear images in dry climates, allowing you to see things with great detail from great distances. If you’re looking for a pair for birdwatching, or simply to see things that are far away from you, you should consider the Nikon A211 10×50 Binocular. It’s available for around $90.00 on most online retail sites. Celestron is a optics company located in Torrance, California. The company is responsible for high quality telescopes, rifle scopes, binoculars, and a bevy of other products. Their top pair of binoculars under $100.00 is the Celestron Nature DX 8×32 Binocular. Its wide field of view and precise image make it a product that’s great for anyone wanting to see objects from far distances. With an 8x magnification and a lens diameter of 32 mm, it doesn’t provide the same amount of light as the first two pairs on the list, but still provides you with excellent images and stellar magnification prowess. A whopping 378 foot field of view allows you to cover a huge amount of space from 1,000 yards or over. This is much larger than the previous pairs on the list. A 14 mm eye relief gives you plenty of room if you wear glasses, and allows you to hold the housing at a comfortable and appropriate distance from your eyes. Measuring in at 4.3 inches x 4.5 inches x 1.6 inches, its a very compact set. Weighing just 12.1 ounces, it is beyond is to carry around and store away. A rubber housing makes it easy to hold while also providing it with a great deal of protection and durability. Waterproof, you will have no problem using it in either dry or wet conditions, making it great for all purposes. With easy-to-focus multi-coated optics, it provides you with a quick, clear, and precise image from any distance. Online reviewers love this set for how easy it is to carry around, with many reviewers stating that they can easily fit it in their pocket. Reviewers also laud it for its field of view and clarity, stating that they can see a great deal of detail with minimal movement from long distances. Some reviewers had trouble focusing it, stating that it was difficult to get a clear image from long distances. Other reviewers, however, had no such problem. A few reviewers complained about its weight, but at just 12 ounces, it’s about as light of a set of binoculars as you’re going to find for its quality. All in all, the Celestron Nature DX is a great set for all purposes. Its huge field of view and compactness make it a great, but easy-to-carry tool. If you’re a birdwatcher, hunter, or are just looking to see things from great distances, you might want to consider the Celestron 71330 Nature DX 8×32 Binocular. It’s available for around $100.00 on most online retail sites. Maybe you’re just looking for a pair of binoculars to use every once in a while at a sporting event, or perhaps at a graduation ceremony. In this case, you probably don’t want to spend a great deal of money on one. Fortunately, there are plenty of affordable pairs out there that provide you with great quality. One of these is the Nikon 8217 Trailblazer 8×25 ATB Binocular. With an 8x magnification and a 25 mm lens diameter, it won’t emit quite as much light as the other pairs on the list, but will still do a great job of enlarging small objects at a distance. It only possesses a 65.5 foot field of view, so it’s not great for hunting or birdwatching, but will work just fine on stationary objects. A 9.6 mm eye relief makes it appropriate for people who do and don’t wear eye glasses. Weighing in at 13.6 ounces, it’s fairly light. At 5.2 inches x 4.1 inches x 2.9 inches, it is compact enough to store and carry with ease. Waterproof, it can withstand both dry and wet climates, allowing you to take it with you anywhere worry-free. A rubber housing provide it with durability, and make it very ergonomic. Several layers of anti-reflective optics provide you with a clear, crisp picture regardless of your distances from the object you’re looking at. Online reviewers love this set for how compact it is, stating that it’s very easy to carry around, whether it be in a back pack or in their hand. Reviewers also give it credit for its picture quality, noting how well it depicts stationary objects and scenes. Some reviewers believe that they could have found similar quality for much cheaper, stating that it didn’t live up to, what they believe, is representative of the Nikon name. Other reviewers criticized its cheap lens covers, saying they would fall off easily without interference. Overall, the Nikon 8217 Trailblazer 8×25 ATB Binocular is a great set for people looking to see long distances on a budget. While its field of view is much smaller than more expensive models, its picture quality for what it does see is fantastic. If you’re looking for something to have on hand just in case you need to see something from a distances, the Nikon 8217 Trailblazer 8×25 ATB Binocular might be just what you’re looking for. It’s available for around $75.00 on most online retail sites. Magnification refers to how much bigger an object appears through the lens than what it actually is without looking through the lens. So, if a pair of a binoculars has a magnification of 8, an object that you see with your bare eye will appear 8 times bigger when the lens is being used. When perusing binoculars, you will see a two number combination that appears something like this: 8 x 32. In this combination, the first number refers to the magnification while the second number refers to the lens diameter. Lens diameter is quite simply the diameter of the front lens measured in millimeters. The bigger the front lens, the more light that will be allowed into your view, allowing you to see objects more clearly in situations where there isn’t much light. So, between an 8 x 32 and a 6 x 28 pair of binoculars, you’re going to get an overall better view with the 8 x 32 pair. But, it should also be noted that the higher the magnification is, the more jumpy and bouncy your view is going to be. Plus, higher magnification equals less light. It is for this reason that you should stick with something around a 7 or 8 magnification. The only way you should go with something higher is if you really need to see things at far distances. And, if you do, you should also look for a larger lens diameter. This will provide you with more light and make your view more clear overall. Field of view is another very important aspect of binoculars. The term refers to how wide of an area the lenses will allow you to see. If you’re hoping to use the binoculars on things that are in motion, such as with bird watching, you’re going to want a pair with a wide field of view. This will keep you from having to move the lenses back and forth as much, reducing shakiness, and giving you a better view. Field of view is often affected by the relation between magnification and lens diameter. Typically, the further the magnification is from the lens diameter, the wider field of view you’re going to get. So, something that’s 8 x 32 is going to give you a wider field of view than something with 9 x 32. In a typical pair of binoculars, your field of view will be between 6 degrees and 7.5 degrees. This figure is often measured in feet as well. When field of view is being measured in feet, it is referring to the width of the area captured by the lens from 1,000 yards away. In general, a good pair of binoculars is going to have a field of view of 350 to 400 feet at 1,000 yards away. Another important aspect to consider when choosing binoculars is eye relief. This term refers to how far away your eyes can be from the eyepiece before the quality of the view becomes reduced. This is especially important for people who wear glasses, as they are not going to be able to get quite as close as people who don’t wear glasses. 12 mm and more is considered adequate eye relief. It allows you to keep your eyes away from the eyepiece without sacrificing any quality in your view. You will see the full picture with precision and clarity. To assist in further eye comfort, many pairs of binoculars come with rubber eye cups that fold in and out, and give you something comfortable to rest your eyes on. Higher end binoculars may even be able to extend and retract these cups mechanically. Whatever you choose, you want to make sure that it accommodates your eyes. If you don’t wear glasses, you should be able to swing it with minimal eye relief. But, if you do, make sure to get something with an eye relief of at least 12 mm. Different binoculars offer a variety of different features and characteristics, each of them providing you with certain benefits and drawbacks. You might want a pair that is very compact and that can be carried around easily without worry. While these do exist, they typically aren’t going to have as much power as the larger versions. However, there are a few pairs out there that pack a lot of power into a small package. If you’re a hunter or birdwatcher, you’re probably going to want a pair that’s waterproof. These types will eliminate moisture-related problems such as foggy inner-lenses, and will allow you to use them outside with confidence. Image stabilization is another feature you might like. It essentially refers to the binoculars’ ability to reduce natural shake. Usually, when there is too much movement in the picture, you’ll get a great deal of blur. But, when the image stabilization is on, movements will come in clear, providing a more precise view. None of these features are necessities, but they are certainly things to look out for. They can greatly improve your overall viewing experience, making your purchase more worthwhile in the end. A pair of binoculars can turn bland experiences into beautiful ones. It can transform the boring and mundane into exciting and awe-inspiring. Whether you’re a birdwatcher, a hunter, or just want to be able to see things clearly at a great distance, a pair of binoculars is a great tool for you. But, not all pairs are the same. Some provide more magnification. Some emit more light into their views. Some have features that transform your viewing experience from a great one to a brilliant one. It’s important to do the research when perusing binoculars. Read reviews, study the product descriptions, and make sure you know exactly what you’re buying. After you have done this, you can purchase an excellent pair that will provide you with exactly what you’re looking for.